Most important things first... Antoinette had a perfect and gorgeous baby early this morning! Mama and baby are doing well! Yay!! LOVE, LOVE, LOVE!! Thanksgiving is coming!! I can't wait!! It's totally my fave holiday. 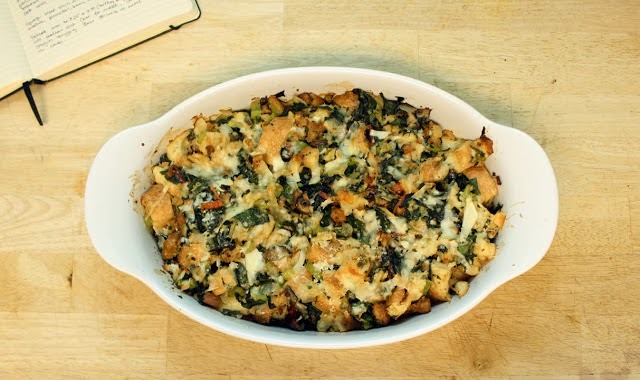 Last year I posted my favorite stuffing (dressing?) 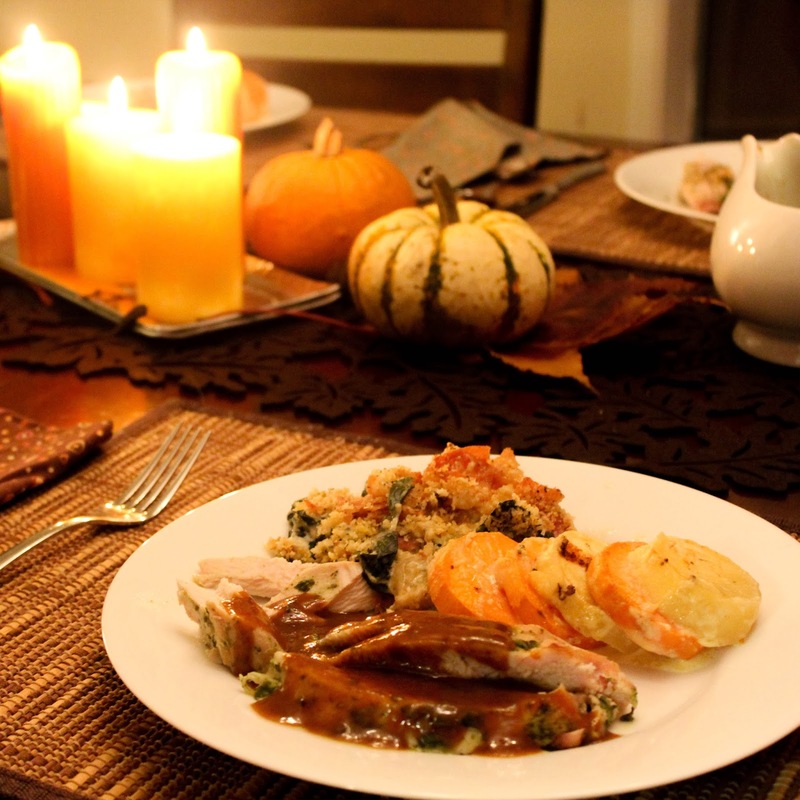 This year I thought I would do a larger Thanksgiving round-up of recipes new, old and loved. My mom came to town early and we had a pre-Thanksgiving... I got to cook with my mama, which is such a treat. So fun! 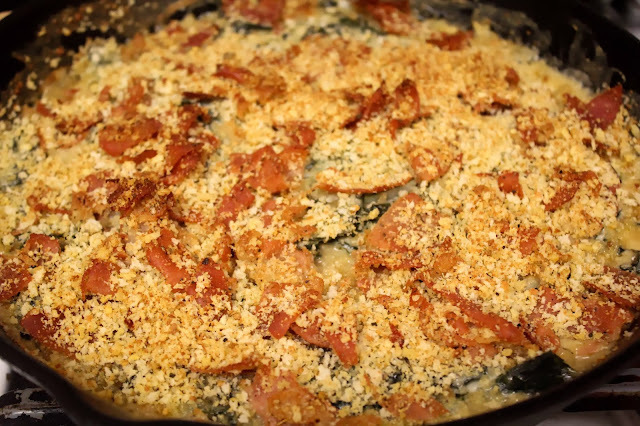 The new standout recipe this year was Collard Greens Gratin with a creamy Parmesan béchamel and a crunchy prosciutto topping. Oh my goodness. This is THE BEST. Bon Appetite crafted this wonderful recipe, but in my opinion it was super fussy. I knew I wouldn't make it twice if I had to switch pans and use up that much time, so I worked through revamping it to be a bit simpler in execution, but keeping all of the elements. I didn't make my own breadcrumbs or ice down some boiled greens just to bake them again. Nope. Not gonna do it. Those are the sorts of things I stripped out. The GREAT stuff is all still in here. Start a very large pot of salted water to boil. 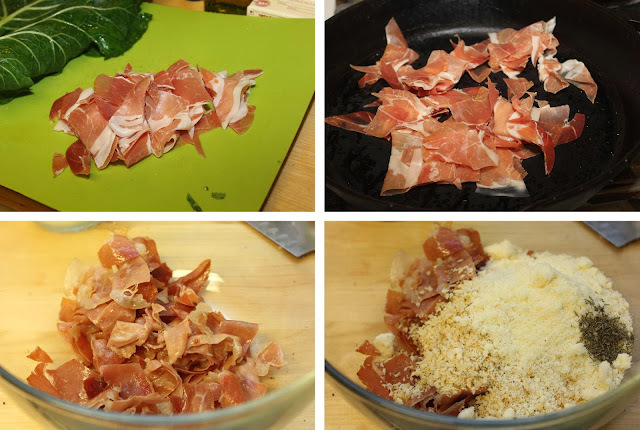 Roughly chop the prosciutto and with one tablespoon of olive oil, crisp the ham in a cast iron skillet. Remove the crisped ham and in a small bowl add it to the bread crumbs, Parmesan cheese, and thyme. Set aside. In the same pan saute sliced onions and garlic until onions are caramelized, about 10 minutes. Stir occationally. 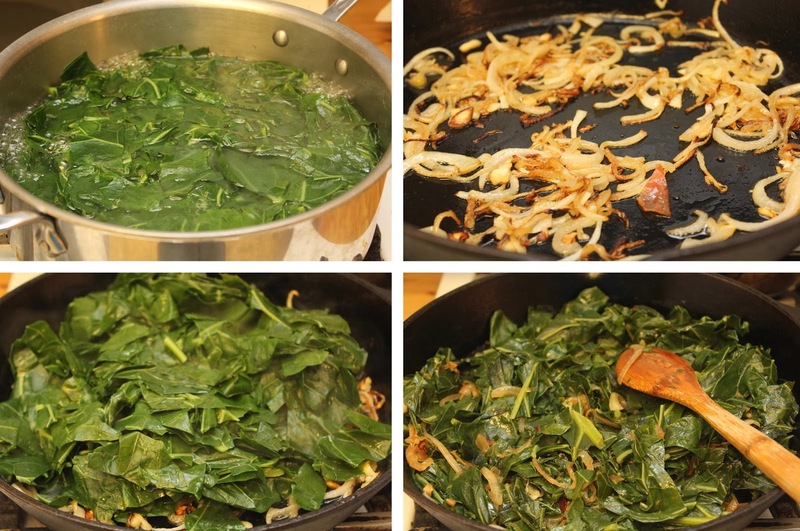 While the onions are cooking, add ribbed and chopped collard greens to the salted and boiling water. Boil greens for 5 minutes. When onions and collards are done cooking, add drained collards to the hot skillet. Season with salt and pepper. Let the greens and onions sit in the hot skillet while the béchamel cooks. To make the béchamel melt 2 tablespoons of butter in a small pan. Add 2 tablespoons of flour and cook until bubbling and very slightly browned. 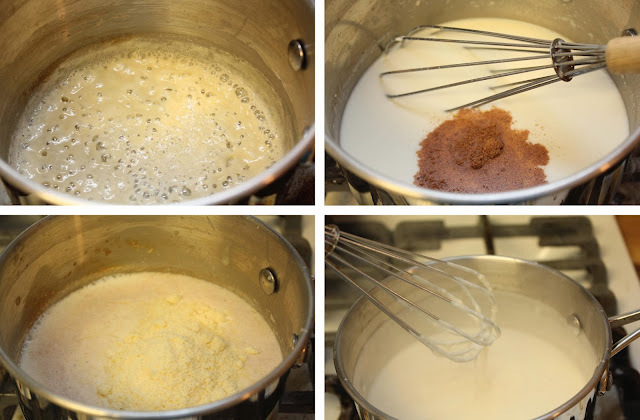 Add in the milk, by 1/2 cup-fulls, whisking all the time. Add in the ground nutmeg. Cook until milk has tiny bubbles at the edges of the pan, then add in the Parmesan cheese. Cook over low heat until cheese is melted and sauce has thickened, about 3 minutes. 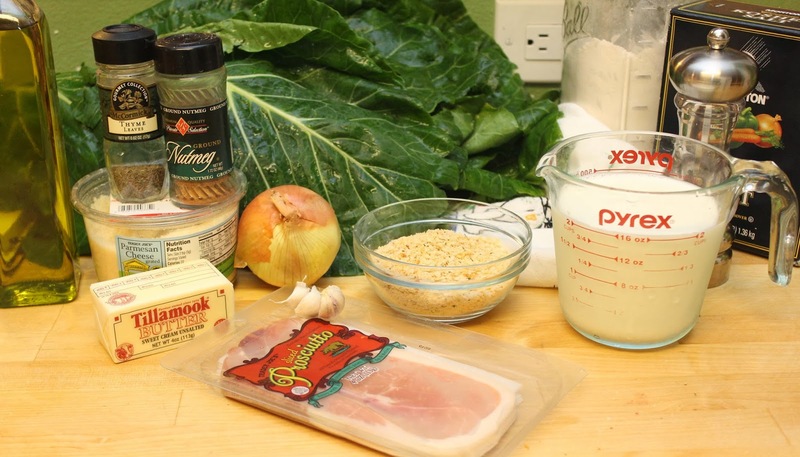 Pour béchamel over the greens and onions and toss lightly in the cast iron skillet until the sauce is distributed over the greens. Scatter the bread crumb and prosciutto topping over the greens and bake at 400 for 15 minutes, or until sauce is bubbling and topping has browned in spots. Cool slightly and enjoy! Oh my goodness - this is fantastic! This would also be good with Swiss Chard or kale. I could eat this day in and day out. It was delicious. I will keep posting Thanksgiving faves until The Big Day!